Generally, fabrics take the name of the fiber used to manufacture it such as fabrics made out of 100% Cashmere Fibers is named as Cashmere Fabric. However, certain fabrics although uses a particular fiber 100% or uses a blend of different fibers may be termed otherwise and are named depending on weaving patterns, texture, and the processes, etc. such as Organza fabrics were often used to produce with Silk, but even though they started using it with alternate fibers, it continued to be called as Organza Fabric. Each fabric carries a unique name in order for it to be identified among others based on their textures, designs, weaving patterns, aesthetic values, fiber source, the place where the fabrics are originated, etc. A trade name for a cloth patented in Britain in 1886, which was first manufactured in 1888. The cloth traps air in between its structure, keeping the body cool in summer, and warm in winter. Two threads or ends act as one thread; when a weft thread passes between them, the doup ends twist catching the weft and holding it tightly in place. Very fancy and beautiful clothes can be produced by combining the cross weaving with other weave structures. Aida cloth is a cotton fabric with a natural mesh pattern generally used for cross-stitch embroidery. The open, even-weave Aida fabrics’ natural stiffness enables the fabric the embroiders choice. Baize is a smooth, dense, durable textile fabric made from wool and cotton blends generally used on gaming tables such as snooker tables, billiards tables, and blackjack tables. The durability and smooth finishing combined with less friction make Baize Fabric a perfect candidate for the surface of the gaming pool tables. Batiste Fabric is one of the softest of the lightweight opaque fabrics made from cotton, wool, linen, polyester, or a blend. The fabric is often made with a soft face and a slight crispness, majorly used for Christening gowns, nightgowns, and underlining for wedding gowns. Bird’s eye is a double knit fabric with a combination of tuck stitches along with knitting stitches. The tuck stitch creates interesting eyelet or hole effect on the fabric surface resembling a bird’s eye. FabThe fabric usually made of multi-colored threads creating scrambling effect. The fabric may be made with designs having eyelets. They are a popular clothing fabric, especially women’s wear. The word is derived from the obsolete French word Bombazine applied originally to silk but later to tree-silk or cotton. Bombazine was woven with a silk warp and worsted weft which is twilled or corded and used for dress materials. Brocade is woven fabrics having a raised floral or figured design that is introduced during the weaving process, usually by means of a Jacquard attachment. The design, appearing only on the fabric face, is usually made in a satin or twill weave. The exquisite fabrics are produced by weaving with warps and weft threads of different colors and often of different materials. Brocade refers to those textiles wherein patterns are created in weaving by transfixing or thrusting the pattern thread between the warp. In brocade designs with special threads are transfixed in between skipping the passage of the regular weft over a certain number of warp threads and by regularizing the skipping by means of pre-arranged heddles for each type of patterning. It is a stiff coated fabric made from a lightweight loosely woven fabric, impregnated with adhesives and fillers. This fabric is used as interfacing so as to provide support and shape retention to necklines, collars, belts, cuffs, waistbands, button closures etc in garments. They are also used as reinforcements for handbags and other articles. Cable fabric is a double knit fabric made by the special loop transfer technique. The wales in the fabric have a rope-like an appearance, where plaits are based on the transfer of loops with adjacent wales. The fabric has an interesting surface texture like braids as the loops cross each other. It is widely used as sweater fabric. Calico is plain, tabby woven fabrics printed with simple designs employing one or more colors. Calico is a woven fabric made from 100% cotton fibers. It is unbleached, undyed and not fully processed during production. This results in the fabric being light beige color and quite rough in appearance and texture, and it may contain unseparated cotton husks.Chintz is a variation of Calico Fabric. Cambric is a very fine bleached linen in imitation of the French fabric made around Cambria (France) and hence sometimes called French Lawn in Scotland. Due to the ease of maintainability, Cambric fabrics are ideal for handkerchiefs, children’s dresses, slips, underwear, and nightgowns. Charmeuse is a lightweight satin weave fabric, traditionally used to make with 100% silk now are generally made with polyester fiber. The smooth touch, elegant sheen, and high drapability make the Charmeuse fabric ideal for lingerie and elegant evening gowns. Chenille is a heavyweight, rough woven fabric often used for upholstery, curtains, and cushions. Corduroy is made from major textile fibers with one warp and two fillings. After it is woven, the back of the cloth is coated with glue; the floats of pile yarn are then cut in their center. The glue prevents the filling from drawing out of the goods during the cutting. The glue is removed from the face, which is then subjected to a series of brushings, waxings, and singeings to produce a velvetlike ribbed finish. Casement is a medium weight cotton fabric made of closely packed thick warp yarns. Generally, it is used for curtains, table linen, upholstery and rarely used for dresses. It is a popular lightweight sheer fabric having an open weave. It has a low count fabric consisting of carded yarns. Originally it was used for wrapping cheese or meat and hence the name. It is neither strong nor durable. It is finished in a variety of ways that attract the consumer. It is used not only for women’s and children’s dresses but also for drapery fabrics. Due to its open structure, it does not require much ironing. Cheviot is a woolen fabric made originally from the wool of Cheviot sheep and now also made from other types of wool or from blends of wool and man-made fibers in plain or various twill weaves. A rugged tweed made from uneven yarn, this fabric usually has a rather harsh hand. Cheviot fabric is fine, soft, and pliable. the fabric has a crispness of texture similar to serge but is slightly rougher and heavier. Chiffon basically refers to a light plain weaved sheer fabric with a soft drape of alternate Sand Z-twist crepe yarns. The twist in the crepe yarns puckers the fabric slightly in both directions after weaving, giving it some stretch and a slightly rough feel. These fabrics when held up to the light, strongly resembles closely woven netting. Chiffon fabric can be manufactured using different fibers like silk, synthetic, polyester, rayon, cotton, etc. but it is generally associated with fibers like nylon or silk. Chiffon fabric can easily be dyed in contrast to any desired color shade and used for bridal gowns and also appears in evening dresses, prom dresses, and scarves. Chino Fabrics is the slightly lustered woven fabrics made out of Cotton is usually used for trousers and military uniforms. Chintz is a medium weight, plain woven cotton yarn. It is often given a glazed finish which may be temporary or semi-permanent glazed chintz are available in solid colour as well as printed with floral prints. These are often made from blends of cotton and polyester or rayon. They are used for skits, dresses, blouses, pyjamas, aprons, and draperies. Crepe fabrics are without prominent weave effects but have a crinkled or pebble surface. It is a plain woven fabric made of very high twist yarns, either in one direction or both warp and weft hence, giving the pebble effect. It may be manufactured in the range of light to medium weight. The fabric has silk-like texture and drapes well. It is used for making dresses, blouses, linings, scarves and in home furnishings too. A wide range of crewel fabric come from Kashmir in north-western India. Because of its versatility, a crewel fabric is widely used for the manufacturing of curtains, light upholstery, bed-heads, cushions and bed covers and so on. Due to its longevity, exquisiteness and with its aesthetic appeal, crewel fabric has been ruling the international market. The availability of crewel fabric in subtle lustrous color and rich texture makes it one of the most demanding items. A crewel fabric possesses the capability to complement various types of body tones. Damask is a heavyweight, rough woven fabric often used for upholstery, curtains, and cushions. The fabric often uses floral patterns or reversible figures. Denim fabrics generally used for making jeans is a rugged cotton twill. In denim fabric, the weft passes under two or more than two warp fibers that produce the common diagonal ribbing which is identifiable on the back of the fabric.The diagonal ribbing separates the existence of denim fabric from cotton duck. The denim fabric is generally colored with indigo dye to create blue jeans though jeans denoted a distinct lighter cotton textile. Denim fabric is used on a large scale all over the world economies. Its vivid texture and ability to provide extreme comfort makes it one of demanding fashion entities all over. With blissful shopping experience, people are moving toward more purchasing new innovative designs of denim fabric. Dimity – the sheer plain weave fabric is characterized by vertical ribs or cord stripes at regular intervals. The fabric is often used for summer dresses, blouses, aprons, curtains, bedspreads, scarves, wedding apparel, and baby clothes. The drill is a type of twill woven fabrics made out of Cotton fibers, generally termed as Khakhi, used for uniforms, workwear, sailcloth, upholstery, tents, etc. due to its durability. Double Knits are made from the interlock stitches and its variations. The process involves the use of two pairs of needles set at an angle to each other. Fibers that the generally used to make double knits are polyester and wool. Double knits are weft knitted fabrics made with two sets of needle beds. The fabric structure is more stable and compact. The fabrics do not curl at the edges and do not ravel. They may be made with interesting designs and textures. One or two yarns are used to knit one course in the fabric. 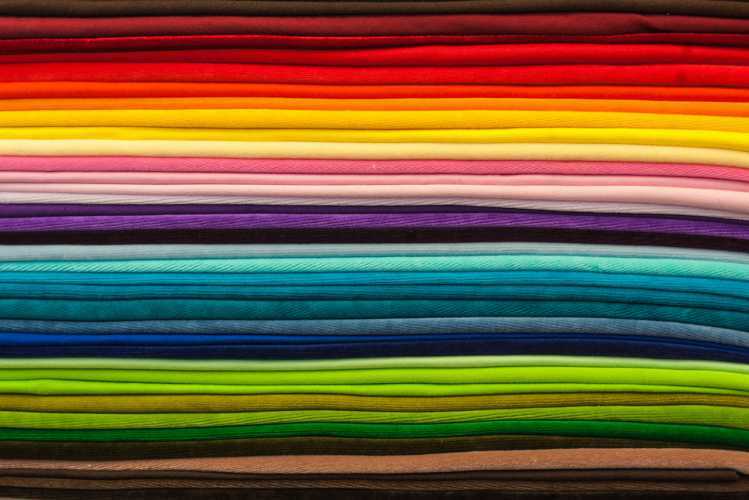 Canvas fabrics are generally made of Cotton, Linen, or synthetic in heavyweights with an even firm weave.Generally used for tents, motor hoods, belting, packagings, sneakers, painting canvases, tents, sandbags, Duck fabrics are rough fabrics. A number of Canvas fabrics are commercially available made with various fiber sources such as Cotton, Linen, Hemp, and colors blends. Natural fibers such as wool are pressed and condensed together with heat and pressure to make a sheet of fabrics are called Felt Fabrics. Felt fabrics are non-woven fabrics. Fiberglass is a material that generally consists of extremely fine glass fibers and often used in manufacturing different products like fabric, yarns, insulators and structural objects.